Tasty Minstrel Games has solidified their position as one of the big publishers on Kickstarter through successful campaigns of Eminent Domain and Kings of Air and Steam. Their newest project is a two-player abstract called For the Win, and this time around they’re trying something a little different: three levels of limited “pay-what-you-want” pledges. But there’s no need to rush off; those pledge levels sold out almost as soon as they were listed. You still have an opportunity to chip in at a reasonable price (and potentially justify a third- and fourth-player expansion through stretch funding). We received a print-and-play prototype of For the Win from Tasty Minstrel. What did we think of it? Find out below! For the Win is an abstract game for two players that takes around 15-20 minutes per game. 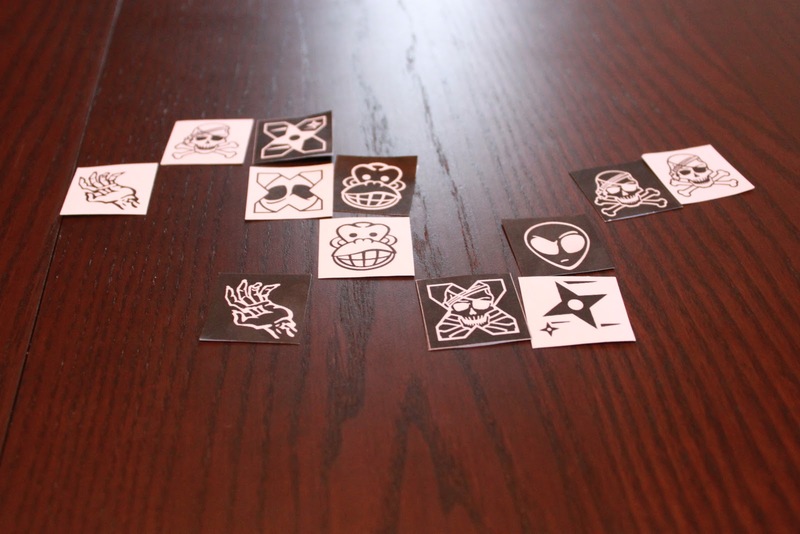 Each player has a stable of ten tiles, two each of monkeys, zombies, aliens, pirates, and ninjas. The goal of the game is to complete a string of at least one of each type of your active tiles before your opponent does. The game starts with each player placing a monkey tile in the center of the table side-by-side. Players flip for first-player initiative. The game is played in rounds, and initiative alternates from round to round. A round is played over a number of turns, during which players may take either one or two actions. These actions can be adding a tile (not adjacent to a player’s own), moving a tile one space, “shoving” tiles (moving all tiles connected to the shoving tile in a row or column) one space, using a tile’s ability, or flipping a used tile face-up. Only active tiles can move, shove, or use an ability (and only active tiles count toward the game-winning condition! ), so using tiles to their maximum potential is a balancing act. As I mentioned, players may take either one or two actions on their turn. Each player has a board to track how many actions they’ve taken, and once a player reaches five actions, he must wait for the other player to reach five actions before the round refreshes. Once both players have taken five actions, initiative passes to the other player and turns/actions continue to alternate. Seems simple so far, right? The heart of this game lies in the special powers of the different tile types, which are individually thematic. The alien may use its “tractor beam” to bring any tile next to it. The monkey can flip over all adjacent tiles. (I imagine Donkey Kong’s ground pound.) The ninja can stealthily move to any location on the grid. The pirate can use his cannon to blow an adjacent tile anywhere else on the grid. The zombie can replace any adjacent tile with any zombie tile left in players’ supplies (or, if no zombies remain in players’ supplies, the zombie may use this power to deactivate an adjacent tile). The first player to connect at least one active tile of each type is the winner. For the Win is a clever and surprisingly fun abstract game. It has an addictive quality to it, and its short play time allows for multiple rounds in a single sitting. The theme for the individual pieces is well implemented and helps to solidify the rules in my mind as I play. (Of course an alien draws tiles next to itself: it has a tractor beam!) I also like the alternating actions system. Because each action is fairly limited in itself, sometimes a power grab involves multiple actions. But this must be balanced against who has the initiative and how many actions in a row this allows your opponent to take. (If you have the initiative and use all your actions, you could open up four actions in a row for your opponent, a scary prospect.) The game’s mechanics are spot on and provide for lots of interesting decisions, and the tile powers and knowing when to use them keeps things interesting. Based on gameplay alone, For the Win is a slam dunk. 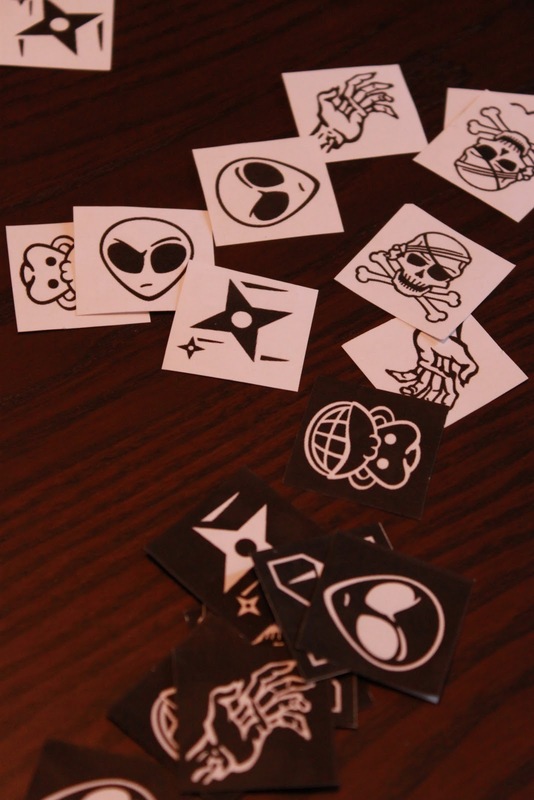 Aliens, Zombies, Ninjas, oh my! …However, for me the theme (or flavor, really—kind of like a Knizia game) leaves much to be desired. Yes, each tile has an individual thematic story, but the combination of so many disparate lores into one game doesn’t deliver the goods for me. It feels similar to a criticism many reviewers have leveled against Father Christmas’s appearance in C.S. Lewis’s The Lion, the Witch, and the Wardrobe: he just doesn’t belong in that story. (Though there is an excellent defense for that, involving the medieval cosmos and “Jupiter: the Bringer of Jollity,” but I’ll let you read about that on your own time.) 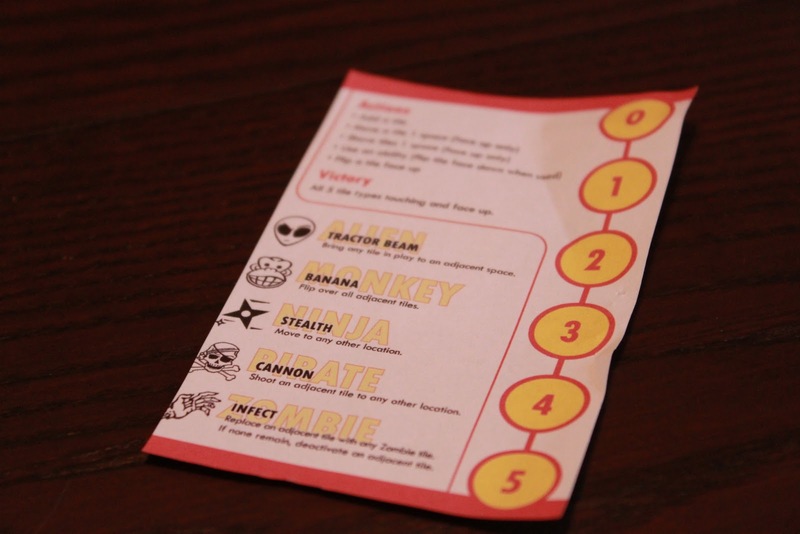 In For the Win, yes, you are playing with pirates, ninjas, aliens, zombies, and monkeys—but why? Because of this, and because most of my friends fit into this same category, it’s hard for me to present this game to others without some embarrassment. When I told my wife I had a game I wanted her to try, she asked what it was about. I explained, well, it’s about aliens, ninjas, pirates, zombies, and monkeys. Before she could say no, I said, “It’s really quick,” and because she was in good spirits after watching Downton Abbey, she graciously agreed to play. She even enjoyed the gameplay, but the theme was a hurdle for her, too, and one that kept her from wanting to play again. “For The Win is an abstract game at heart, with a solid theme of Internet memes applied.” That’s a direct quote from the Kickstarter page. As someone who loves solidly thematic games, I need to clear the air right off: I don’t really think this is a “thematic” game. Sure, the tokens are pirates and aliens instead of some abstract shape or made-up name, which is cool; and even the powers given to these tiles kind of make sense. Sort of. (When you think of pirates, you think of transportation by cannon, right?) A highly thematic game has a cohesive experience; it tells a story, it tries to emulate a certain scenario. I play Twilight Imperium to feel like I’m part of a galactic council; Last Night on Earth to fight off hordes of zombies; Shadows over Camelot to play the role of a knight. First, “Internet memes” is too broad and abstract of a concept in and of itself, and it does not make a “solid theme.” This game is not the ultimate bridge between Euro-style and Ameritrash gamers. Okay, rant over. All that aside, For the Win is a solid game. Tasty Minstrel calls it a “tile-laying” game, but really it’s more of a tile-manuevering game. It’s about setting up your tiles so that at the right moment, you can swoop in and nab the victory. The special powers, theme-light as they may be, definitely add some interest. The ability to choose one or two actions, with limited rounds and alternating first-players, definitely adds some tension and some interesting choices. There’s always that push-pull of “do I pull off this sweet action, but allow the other player some breathing room, or do I hold back until just the right moment?” Especially at key moments, you may be forced to sacrifice a strong move in order to prevent the other player from getting up to four moves in a row, which is almost certainly deadly. For the Win is short—you only have ten tiles, and there’s only so much you can do to stop the other player from pulling their tiles together. A game should take about 10-15 minutes. But be warned: playing this game with someone prone to analysis paralysis could be disastrous. It may not be Chess, but it’s definitely down in that direction, and it’s a slippery slope when you start to analyze ever possible action (or actions) the other player could take, and what your response to that action could be. As @FarmerLenny mentioned, though the theme is light, it’s still there, and that may be a turn-off to certain people. Internet memes target a somewhat narrow audience, and there are certainly those who might turn their noses up at the game. However, you might have success if you don’t introduce the game with a theme—just as an abstract strategy game. 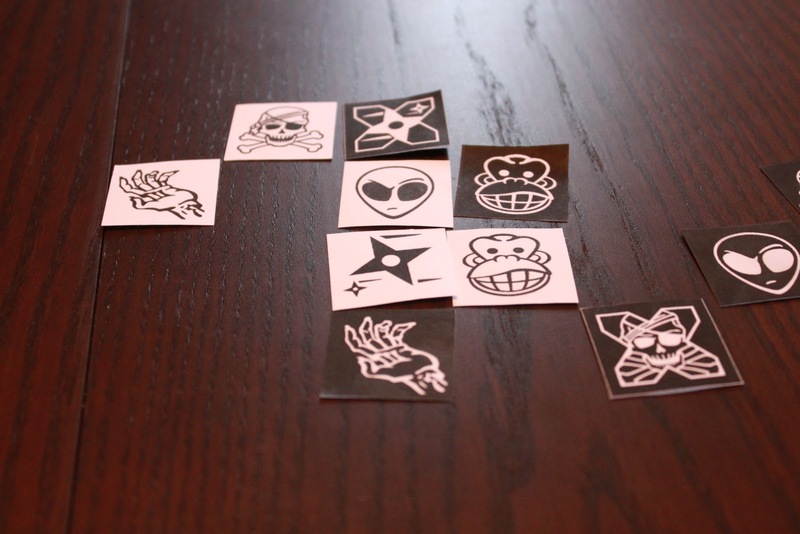 Most people have heard of monkeys, pirates, ninjas, and zombies, and if they go in expecting an abstract game, they might be willing to accept these symbols, whereas they might turn down a game that you say is “about pirates, ninjas, monkeys, and aliens.” You don’t know until you try. Anyways, For the Win is definitely an enjoyable, quick two-player game, and the final product looks to be pretty low-cost as well, which is a plus. Twenty dollars will get you a copy on Kickstarter right now, and that ain’t bad. We had the print-and-play version, so it’s impossible to judge the production quality—but if I could make one change, I would have them include a small board with a grid printed on it. It was sometimes visually challenging to “see” where the grid allowed movement, a facet that could easily be overcome simply by having an actual grid. If you want a thematic game with abstract qualities… I think you’re looking in the wrong place. However, if you’re looking for a solid abstract game with a little flavor, For the Win is right for you. iSlaytheDragon would like to thank Tasty Minstrel Games for sending us For the Win for review. For the Win is currently on Kickstarter, and it is fully funded! If you chip in at least $15 and the game funds at $25,000, Tasty Minstrel will also include pieces for three- and four-player games. All that for $20? That’s an awesome deal. Next Article Now You’ve got a Ticket to Ride!